It is Patrick's first time to sleep over at Granny's house. When it is time for him to go to bed, Patrick tells his Granny that he does not have a bed, so Granny chops down some trees for wood and makes him a bed. Patrick then tells his Granny that he did not have a pillow at her house, so Granny collected feathers from her chickens and made him a pillow. Granny also has to make Patrick a blanket and teddy bear, but by the time she is finished, it is morning. 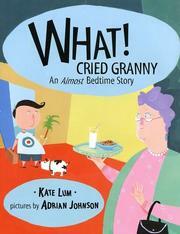 Lum, Kate, “What!Cried granny: An almost bedtime story,” Children's Picture Book Database at Miami University, accessed April 23, 2019, https://dlp.lib.miamioh.edu/picturebook/items/show/10210.